As someone who has spent a lot of time in the Hudson Valley during the last three decades, I take pride, rationally or not, in delicacies that come from that region: foie gras, local produce, black angus beef, duck, cheese and… wine? Well yes, the Hudson Valley does boast many, many wineries. The question is, is any of it good? Dan and I sampled a handful of Hudson Valley wines in the past and weren’t that wowed but we thought maybe it was what we tried. So this past weekend, to give the Hudson Valley its fair shake at winning over our inner Bacchus, we headed out to the Hudson Valley Wine and Food Fest in Rhinebeck, NY. The festival was a little light on the food aspect, but there were booths of wineries lined up as far as the eye could see pouring their entire line-ups. We picked up our tasting glasses, mustered some optimism and went forth, intent on finding some winners. The first wine we tried, a cabernet franc, immediately brought to mind that scene in Sideways where Paul Giamatti’s character Miles declares, “Well, I've come to never expect greatness from a cab franc, and this one's no exception,” as he unceremoniously dumps the remainder of his pour into the spit bucket. Dan and I laughed as we did the same and reassured each other that this was just the first stop. Many tastes of liquid more closely evoking hints of battery acid and metal than berries and earth later, we paused to wonder what was going on. Was there just no good wine in the Hudson Valley? A little known fact, the Hudson Valley is actually the oldest wine region in the country, boasting the nation’s first winery established in 1839 (Brotherhood Winery in Washingtonville, NY). But oldest doesn’t mean the best weather and conditions in which to grow grapes unfortunately. A lot of precipitation plus short, hot humid summers and frigidly cold winters makes for a very challenging environment to produce blue ribbon winners. And many wineries in attendance actually hailed from t he Finger Lakes region, northwest of the Hudson Valley, where the climate is not only unpleasant for wine growers, but just for people in general much of the year. So is wine from upstate New York hopeless? The answer is not entirely. New York State producers tend to turn out a lot of sweet style wines, which in general I don’t particularly care for, especially when they are poorly structured and encased behind a gimmicky label. But, it also means they make a lot of dessert wines and ice wines. This got my attention. Despite its marketing literature informing us that its Solar Flare is “Liquid Sunshine in a bottle!”, we particularly liked this dessert wine from Eagle Crest Vineyards in Hemlock Lake, New York. It had a wonderful nose of honey and apricots and the texture was clean and crisp, not at all syrupy. And at $11, we were very happy with this purchase. We also came home with an ice wine from Johnson Estate Winery and a late harvest wine from Hunt Country Vineyards. We'll admit to adding some Mead to our loot as well. Mead is a sweet wine using honey instead of grapes as its base and the raisin-clove variety we picked up from Long Island Meadery isn’t for the sophisticated wine snob. But when you taste it, it feels like the holidays. Its festive clove notes just encompass all things December. We bought two bottles to keep in the back of the fridge and I look forward to breaking them out when its time for menorahs and Christmas trees. After what seemed like a hunt for a unicorn, we also found some whites we liked alright and some reds we really enjoyed (listed below). And as usual, we came home with some mystery bottles we couldn’t quite remember why we bought. I always love opening those because like magic, the sense memory comes back to when we first tasted them and they either conjure a wonderful experience or something very funny that happened while we tried it to prompt the purchase. One such bottle we managed to actually label this time. Scrawled with “conversation piece” on the paper bag it was wrapped in, Dan reminded me he bought this one because the face I made when I tried it was so priceless that he wants to have a bunch of guests try it simultaneously and take a photo. "Wouldn't that be a conversation piece," he exclaimed. Stay tuned for that post! 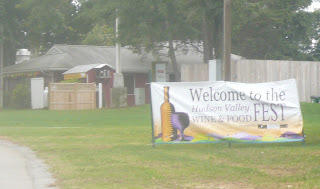 Unfortunately the Hudson Valley Wine Fest does not represent the wine present in the Hudson Valley. There are many good wine producers in the Hudson Valley, some who were present at the wine fest, some who were not. Growing grapes in any region is not easy. There are many environmental aspects, disease and insects to deal with no matter what region you are in. There are many grape varietals that grow very well in the Hudson Valley as well as the Finger Lakes that don't do well in warmer climates. Cold winters when we experience below zero temps for a long period of time kills the vines, it doesn't effect what you put in your glass. The warm days and cool nights that we have now are just what we want. We can't predict a tropical storm coming up the coast, which, yes can effect the grapes during the harvest season. NY vineyards are not the only growing region that has to deal with these circumstances. I am glad you did find some wines that you enjoyed. I hope you come back to the Hudson Valley and visit the tasting rooms where you will find award winning wines you weren't able to taste at the wine fest. I agree that growing grapes is exceedingly difficult no matter where you are, but given some of the added challenges the Hudson Valley and Finger Lakes have it is logical that the ratio of bad wines to good will be higher than in areas more conducive to this type of horticulture. That said, you know the producers better than I do and I would welcome you to make some recommendations in addition to the ones I included in my post. I'd love to give my audience some more worthy wines to try and the wineries the credit they deserve. It's not uncommon for Hudson Valley producers to buy grapes from elsewhere in the state, and when I went winery-hopping in the area almost all the best wines turned out to be from the Finger Lakes. As nice as it would be to have a bona fide wine region within an easy drive of Manhattan, the only categories I've seen in which New York wine is genuinely world-class -- capable of competing on its own terms, and not just selling itself to people who want a local, New York product for ideological or idiosynchratic reasons -- are Finger Lakes riesling and Long Island cabernet franc. Price will handicap the latter as long as you can get a great Loire Valley example for under $20, which is a cinch, but every time I have a Finger Lakes riesling I wonder why they haven't broken into the mainstream yet. Don't miss the Hermann J. Wiemer 2007 Reserve Dry Riesling. Thanks for your comment, Keith. We did sample a lot of dry rieslings at the festival. Some of which were ok (we even brought one home), but in general I would categorize them as having promise but lacking the refinement you would find from a top German, Austrian or Australian producer. That said, and also to HVWG's point, not everyone turned out to show their wares, including Wiemer. So I'll keep the jury out on that one and definitely try the 07 reserve! The wine fest was a good time, but there were definitely some elements that could be improved. First, the food selection was sorely lacking. There were only a small number of food options, and many of them had long lines. There were some good food vendors at the festival itself(in particular, we had some very good cheese), but this didn't make up for the lack of general food options at the fair grounds. It was a big letdown compared with my last experience at the fair grounds (the Dutchess County Fair). Second, the crowd wasn't what I was expecting. It wasn't so much the taste-wine-and-discuss type of crowd as it was the bachelorette-party-wanting-to-try-wine-from-each-of-the hundred-wine-vendors-before-stumbling-to-their-cars type of crowd. As such, the discussion about the wines was a bit unsatisfying. The highlight of the wine festival was the great system for allowing you to buy your wine and not having to carry it around with you all day. Each introductory packet had a list of claim tickets that allowed pick up all your purchases from a tent in the parking lot at the end of the day. At each vendor, you could just tag your wine and expect to see it at the end of the day. With this kind of convenience, we definitely bought more wine than we would have otherwise. Ingenious!